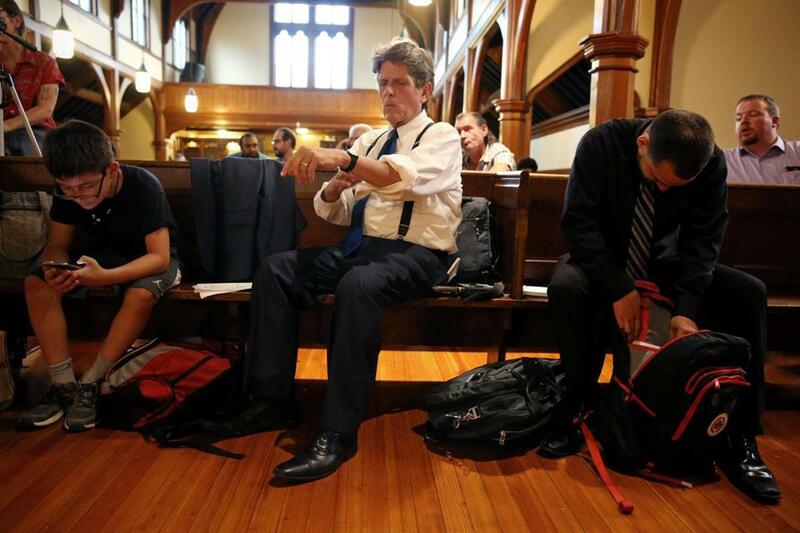 Bob Massie prepared to speak at an event titled Race & Economy in Boston at St. Mary’s Episcopal Church in Dorchester on Aug. 2. For nearly a decade, Bob Massie was dying. Liver disease had slowed his body and his mind — it was like being 105 years old, he says. After a lifetime of battling hemophilia, then contracting HIV and hepatitis C from infected blood products, he needed a new liver. In Florida, a young woman named Jean Handler needed a new liver, too, to treat a damaging medical condition. Doctors were confident, though, that Handler’s liver would work fine in someone without her underlying disease. So in July 2009, at Emory University Hospital in Atlanta, surgeons performed a rare procedure known as a domino transplant: Handler received a cadaver’s liver, and Massie received Handler’s. Handler, now 33, is doing well, living in Boca Raton. Her old liver, some 1,500 miles to the north, is also thriving. For Massie, 62, the transplant led to “a complete resurrection,” he said, that not only eliminated his liver disease, but also corrected the hemophilia that had attacked his joints and put him in leg braces and a wheelchair during childhood. In the Massachusetts governor’s race, Massie, the 1994 Democratic nominee for lieutenant governor who was overwhelmingly defeated, is looking to pull off something of a political resurrection, running in the Democratic primary as a Bernie Sanders-style progressive “with a grounded understanding of the economy,” he said. His opponent is Jay Gonzalez, who served as secretary of administration and finance in Governor Deval Patrick’s administration. The Democratic nominee almost certainly will face first-term Republican Governor Charlie Baker, who has consistently polled as the most popular governor in the country. Defeating him will be a tough task for either Democrat. Win or lose, a single campaign “is part of a bigger commitment, a bigger struggle,” said Massie, a Somerville resident. Later that evening, Massie was at St. Mary’s Episcopal Church in Dorchester, where he had been invited to speak to a small gathering. As parishioners fanned themselves in the heat, Massie delivered a lengthy and blunt speech on race relations, an issue he has studied for decades. He wrote a 900-page book on the United States’ relationship with South Africa during the apartheid era, published in 1998. “The disturbing reality is that many members of the white community are deeply reluctant to talk about race for fear of being blamed, or making a mistake, or offending someone, or discovering a new obligation that might require them to evolve and change,” he said, according to a transcript of his remarks provided by the campaign. The broadly progressive political views Massie espouses come “first and foremost” from his health problems as a child, he said, and “my experience of being excluded — and really instantaneously excluded. Both of Massie’s parents are accomplished authors and experts on Russian history. His father’s 1967 book, “Nicholas and Alexandra: An Intimate Account of the Last of the Romanovs and the Fall of Imperial Russia,” was adapted into a movie. His mother personally advised Ronald Reagan on US-Russian relations. Judging strictly by personal history, Massie can almost seem like the guy from the beer commercial, the Most Interesting Man in the World, except instead of the catch phrase Stay thirsty, my friends, his would be more like: We’re not doing enough to address income inequality, institutional racism, and the gathering threat of climate change. Like Gonzalez, he is more focused on Baker than on his Democratic rival. Massie believes that Baker-style incrementalism isn’t enough to solve modern challenges. Massie has called for a $15 minimum wage, he wants to “move aggressively” toward single-payer health care, and he would stop privatizing government services. He wants to forge ahead with major transportation projects, viewing a world-class system as part of the solution to income inequality. “Government is responsible for planning and implementing the infrastructure that gives businesses and people greater freedom, and we’re not doing that,” he said. He was born in New York City in 1956. Between contractions, his mother, Suzanne, watched the Democratic National Convention nominate Adlai Stevenson for president. Massie’s father, Robert, became a journalist, writing for Newsweek and The Saturday Evening Post. Bobby, as his parents called him, was quickly diagnosed with hemophilia, a disease that prevents blood from clotting normally. Raising a child hemophiliac in the 1950s and ’60s was an enormous struggle, so difficult that Massie’s parents wrote a book about it: “Journey,” published in 1975, when Bob Massie was about 18. The book is full of harrowing stories, such as a frantic drive to the hospital in a police car, racing the wrong way down one-way streets in the snow with the Massies clutching their unresponsive son, believing he may have a brain hemorrhage. The common perception of hemophilia is that cuts don’t stop bleeding, but Massie says that was not his most significant problem; he would just bandage his skin and his body would ultimately heal it. The real problems were in his joints. “The joint would fill with blood,” Massie recalled in a Globe interview. Untreated, “the only thing that would stop the blood is when the pressure inside the joint equaled the pressure your heart was generating. And I have to tell you, I went through a kind of torture as a child. It was overwhelming pain. The book about Massie’s childhood also has striking moments of grace. The Massie family was friendly with the folk group Peter, Paul and Mary. One night when they were visiting, Bobby was in pain and couldn’t sleep. Peter Yarrow brought a guitar into Massie’s room, sat beside his bed, and performed the band’s songs, including “Puff, the Magic Dragon,” until Massie drifted off. Massie majored in history at Princeton, graduating in 1978. He went straight into Yale Divinity School, when he became very sick with a mysterious illness and had to leave school. That mystery disease, he believes, was related to his initial infection with HIV, which he contracted from infusions of tainted blood products. He recovered enough to work for Nader in 1979 and 1980. During that time, “I began to work very specifically on distinct aspects of corporate power and of economic justice,” he said. But his faith called him, and again he went back to divinity school, graduating in 1982. From 1982 to 1984, he was an assistant minister at Grace Church in New York City, at 10th Street and Broadway. He came to Boston in 1984 to attend Harvard Business School, and from 1985 to 1988, he was pastor of the former Christ Church in Somerville. As an adult, Massie was able to manage hemophilia more effectively. He learned to sense when a joint was about to act up, and would hit himself with an injection of blood product to help clotting before the onset of intense pain. Massie ran for lieutenant governor in 1994, winning a spot on the Democratic ticket with Mark Roosevelt. It was the reelection campaign of another popular Republican governor, William Weld, and the Democrats lost in historic fashion. Liver disease sidelined Massie in the early 2000s. He started watching a lot of Japanese movies. He read a biography of every US president. He tried to take on little projects but lacked the energy to sustain them, until his transplant, which changed everything. Massie has two sons from his first marriage, which ended in 1994. Two years later he married Anne Tate, and they had a daughter in 1998. From 1996 to 2003, Massie was executive director of Ceres, a Boston-based nonprofit advocacy group on sustainability issues, and he has helped found another nonprofit focused on reshaping the economy. It has been a varied life and career. Massie said he has tried to put it all to use helping people. Mark Arsenault can be reached at mark.arsenault@globe.com.Follow him on Twitter @bostonglobemark.